Resultantly, all actors possibly must have died a little inside as their purported laugh fests are rejected outright by viewers. Johnny Lever, we are all aware that comedy as a cinematic endeavor is the toughest, more so, if the writers don't have anything to chew on. 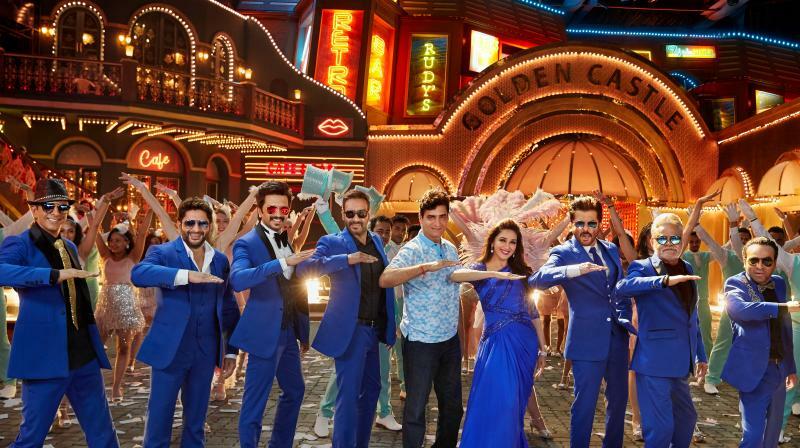 Indra Kumar's third franchise, Total Dhamaal, is a rehash of his earlier films, and, so, has virtually nothing new to offer. It's the same old film made with some fresh faces and largely old timers reprising the same roles they had earlier played. And, as it turns out, the third in the series pales significantly in comparison when it comes to its writing and execution. There are as many as five pairs of characters (Kapoor & Dixit; Jaffrey & Warsi; Devgun & Mishra; Irani & Patkar; Deshmukh & Tripathy, besides a host of other talents like Manjrekar and Johny Lever) all of whom neither have any interesting bits to define their buffoonery, nor do they add any value with their screen roles. Barring a few scenes featuring Dixit and Kapoor as a bickering couple who have filed for divorce, there is nothing that has any semblance of cinema, let alone a comedy. But my problem with the film is not its flimsy premise; nor the sameness of the action: it’s poor and tacky production. Even if it weren’t anything fresh in terms of its storyline, there could have been something by way of madness and craziness for the laughs to continue- if only writers Ved Prakash, Paritosh Painter and Bunty Rathore as well as director Indra Kumar had let their imagination soar creatively to come up with some funny one-liners. At least. Instead, some dialogues offend you. Barring Jaffrey and Warsi and occasionally Lever, everyone crashes through the outer limits of bad taste in this wildly outrageous collection of comedy sketches. Also, as a few of this year's Bollywood releases have been, this one also makes an attempt at being a propaganda film for the ruling party, albeit rather feebly. In one scene, a character screams how there was one Gujarati (with the obvious reference to the Father of the Nation) who did India proud, in this day and age too, another Gujju (no prizes for guessing who) is making the Americans eat pizza! If you don't get the joke, neither did I! As Guddu (Ajay Devgun) and Jonny (Sanjay Mishra) get double-crossed of their illegal booty by their own colleague Daddu a scam begins when another corrupt man, police commissioner (Boman Irani) strikes a deal to legalize money that has been rendered rubbish after demonetisation in 2017. For a change, there is no 5,000 crore empire that one is so accustomed to seeing in Bollywood masala films, but a much lesser booty — `50-crore loot that gets hidden in a zoo. Needless to add, all the characters have the sole intention of finding the cash stashed away in the midst of some wild animals at Omkar Zoo in a place called Janakpur. After claiming their supremacy, the five pairs agree to distribute the ill-begotten money equally,, and thus, begin a chase to reach the zoo at the earliest in different modes of transport. At times, this 129-minute comedy cannot completely escape the indignity of co-starring some computer generated animals to prevent director Kumar's worst attempts at slapstick comedy. The outcome is a series of annoying escapades by the stars all of whom seem completely ill-at-ease mouthing inane stuff or masquerading as serious actors perfecting their act of buffoonery. At a time when nearly all of us receive and forward jokes and videos on WhatsApp on a daily basis, one would expect a silver screen experience to include some sparkle to this limp script and have interesting gags. Resultantly, all actors possibly must have died a little inside as their purported laugh fests are rejected outright by viewers. They all act indifferently and make the film look all the more stale. So shamelessly mindless is the entire plot!